Learn how to use Postcron's massive posts tool, set up your CSV file and schedule up to 1000 posts at once! The Bulk Uploader is a feature that allows you to schedule up to 1000 posts at once using an Excel or Google Docs Spreadsheet (as long as the file doesn't exceed the 240kb limit). The way you do this is by making a .csv file with all the information for your posts (dates, images, links, text) and then selecting the social accounts you want to publish it to. 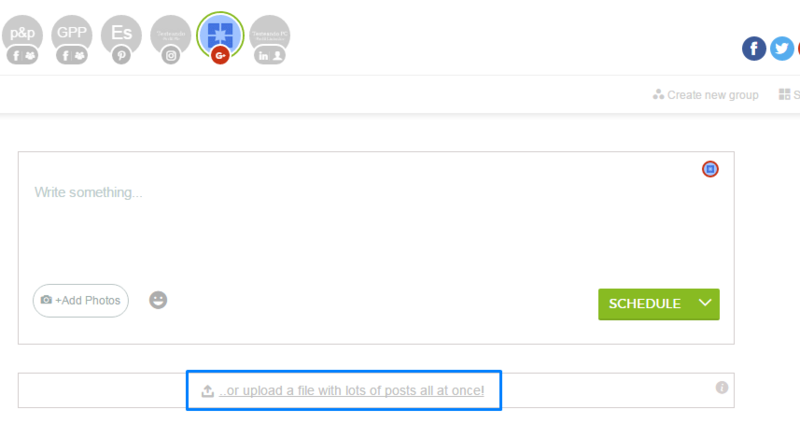 NOTE: Make sure you select all of the accounts you want to publish the posts to before uploading the file. When publishing to different social networks, we advise that you make a different file for each, giving that most social networks have different post formats (example: Twitter's character limit). Here’s a Google Docs spreadsheet to help you get started. Column A: Should contain the text. Column B: Enter the year you want your post to published. Column C: Enter the month you want your post to published. Column D: Enter the day you want your post to published. Column E: Enter the hour (0-23) you want your post to published. Column F: Enter the minute you want your post to published. Column G: Insert the URL to an image you want to add to your post (format must be JPG or PNG). Column H: Insert a link you want to share. Columns A, G and H are optional, so you can leave them empty if you want. Also note that each horizontal row represents a post, meaning that if you fill up the first five rows, for example, you will have five scheduled posts. If you have your pictures in your computer, a great option is using this site: http://postimage.org/ to upload your images from your computer (select: Family Safe) and copy the direct link, with the .jpg or .png extension and paste it in the 7th column. Once you’ve finished adding all the content you want to the spreadsheet, you have to download the file as CSV (comma separated values) by clicking on Save As and selecting the file type: CSV. No image: If you have pasted images URLs into the 7th column and the images don't load in the Bulk Uploader, it probably means that they either exceed the limits imposed (3mb) or the format is not valid. Make sure the URLs for the images end in the extension of the file: .png, .jpg, .gif. Links won't load: The Bulk Uploader should read your URLs the same way that the Publisher does. If the URL is not loading, make sure to paste it in the Publisher through your Dashboard and then, if you see that the link is still not loaded, it is probably because the webpage has issues. If it does, and the Bulk still won't load it, make sure you have pasted it correctly in the file, or contact Support.